Makers – do you listen to handmade business podcasts? Podcasts are such an awesome method of learning for makers, because we can listen to them while we work! Or, while we work out, or commute to our day jobs… they are an excellent choice for absorbing stories and information about how to better run our handmade and Etsy-based businesses. When I started the Create & Thrive Podcast back in 2015, I wanted to bring something fresh to the podcast market. I wasn’t the first person to have a podcast focussed on handmade, but there was so little out there in those days created specifically for handmade businesses, and I knew I wanted to bring something to my community that would help them grow a handmade business specifically. There are TONS of business podcasts – many of which I listen to! – but so much of that information isn’t relevant, or isn’t quite right for makers. Our businesses are very different from info-based business, retail, factory-produced product-based businesses, and coaching/consulting/service-based businesses. Handmade businesses face unique challenges that those other business models don’t have to worry about. 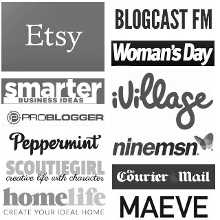 I want to celebrate the wonderful world of handmade business podcasts today, so I’ve put together a list of the current top 10 (in my humble opinion, and in no particular order) podcasts specifically aimed at makers of handmade crafts. This list was compiled in November 2018. You’ll have to forgive me for, of course, including the two podcasts I’m involved in producing in this list! My own podcast, where each week, I share interviews with successful makers or handmade biz experts, alongside publishing solo shows where I share advice gleaned via running my own successful handmade business since 2008; and from the experience of helping thousands of other makers grow their businesses since 2013. My new (as of November 2018) conversational show co-hosted with Deb Engelmajer of Tizzit, and Mikaela Danvers of The Maker’s Collective. Each week, we give a dose of handmade business reality to makers. We laugh, we tell stories, we argue, and we draw on our combined 20 years of experience in the handmade industry. We talk about making as a business, the making of a business, and what it REALLY takes to succeed as a maker and a business owner. Insights and actionable advice for Etsy Shops from hosts Richie, Gordon, and Kevin of Marmalead. The cover lessons learned, share seller Q&As, and host chats with guest shops. The Etsy Success podcast is your source for tips on improving your creative business and inspiration from the Etsy community. This is the only podcast on the list actually produced and published by Etsy themselves, so a must-listen if you’re an Etsy seller. The MC podcast is by maker Danielle Spurge, who runs her own successful handmade business, and teaches handmade shop owners how to optimize + leverage so that they can prosper. This is a bi-weekly podcast by Nicole Stevenson that features interviews, intimate stories and practical advice about creativity and building a life and business filled with intention and purpose. This is the grandmother of craft podcasts – started in 2005 by Jennifer Ackerman-Haywood. Ever since, she’s been interviewing crafty people about what they make, how they live, and the stories of their lives. This is a short and sweet show with maker and educator, Mei Pak. Her goal is to help you make a consistent income selling your handmade products. Each episode addresses one topic as it relates to handmade business and will give you actionable, practical and easy steps to starting, growing and running your successful business. Featuring inspiring interviews with Etsy (& some non-Etsy) shop owners. Hosted by Ijeoma. If Etsy is your bag, this one is for you. This is a podcast for makers about the big picture of your business brought to you by Isaac Watson of the Academy of Handmade. He covers important (and sometimes uncomfortable) topics about running a handmade business and features perspectives and experiences from handmade business owners & the greater maker community. And there you have it! 10 awesome podcasts that will help you to grow your own handmade business. Happy listening!